The next Christmas film on my list is...The Santa Clause! By the way, this is the only one of the trilogy that I love. I don't think the sequel or the third one are worth watching...they're too over-the-top. Here's the story: Scott Calvin is spending Christmas Eve with his son (he and his wife are divorced) when they hear a noise on the roof. When they rush outside, they startle Santa, who happens to be at the chimney, and he slides off the roof. He's unresponsive, but Calvin finds a card that says, "If anything happens to me, put on the suit. The reindeer will know what to do." After a lot of begging from his son Charlie, the dad very reluctantly puts on the Santa suit and spends the night carrying out Santa's job. The reindeer take them to the North Pole, where the head elf informs Calvin that due to the Santa Clause, a line of fine print on the card, when he put on the suit he became Santa Claus. The following year, he starts slowly adjusting to the idea of his new job (and the physical changes that come with it), as his ex-wife and her husband start to question his sanity. 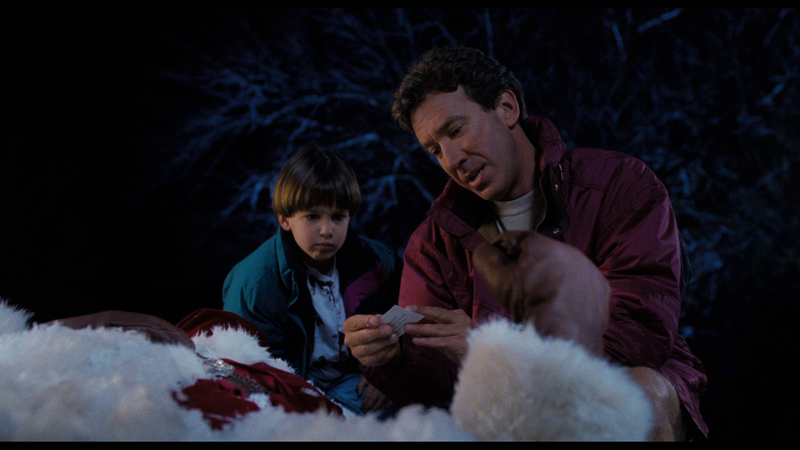 I really like Tim Allen as Scott Calvin/Santa Claus. Even though I can't hear his voice without thinking: Buzz Lightyear. :) He's honestly sort of a jerk at the beginning. He's sarcastic and a bit mean-spirited and not the best dad. Becoming Santa was the best thing that could have happened to him! It's nice to seem him change throughout the film and become a better person. Although I have to admit he does have some pretty funny snarky lines at the beginning. It always cracks me up when he's talking about the reindeer and says, "They all look like they've got Key Lime Disease!" It's also hilarious watching Scott gradually turn into Santa physically, starting with a bit of extra weight and continuing until he wears Christmassy clothes all the time. The young son Charlie is so cute, if a bit whiney and high-pitched at times. And I like the actor and actress who play the mom and stepfather...they're good in their roles. I'm struggling to find a lot of things to say about The Santa Clause. So just watch it and tell me whether I'm the only one who likes it or not! :) I realize that I have a soft spot for 90s movies, especially ones that make me feel nostalgic. But this really is a sweet and often funny story, and it's one of the few Santa-themed Christmas movies that I like. P.S. In case you're wondering, like most 90s films, there is some mild scattered language and maybe a line or two of innuendo. Have you seen The Santa Clause? What do you think about the two sequels?